I have been debating whether to close this blog and start something new. Describing my recent commitment to posting as "poor" would be the understatement of the year. Life at the moment is busy. 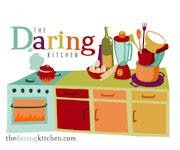 Funnily there has been some cooking going on around these parts - rhubarb & vanilla jam, plum cake, chocolate dipped honeycomb, to name a few- but I can't seem to get organised enough to take some photos and get writing. BUT I have made a wedding cake recently, which was significant enough to inspire photo documentation. My job was really quite easy, the hardest part was getting the cake from Sydney to Canberra in one piece. It was my cousin's wedding, and being the crafty person that she is she decided to make boutonniere, flowers and various other decorations from origami. So I had a very spectacular cake topper to work with and all I had to do was bake, decide on size and scale, and ice the creation. I do think it looks beautiful, and this photo really doesn't do the cake topper justice. It was spectacular. With a bit of luck I will get some copies of the pro shots soon, rather than my dimly lit post wine attempt. How to make the paper not bleed through in the icing? Any ideas? thanks! Hi Mia, we used fondant icing, and it had time to dry quite firm before I added the origami. 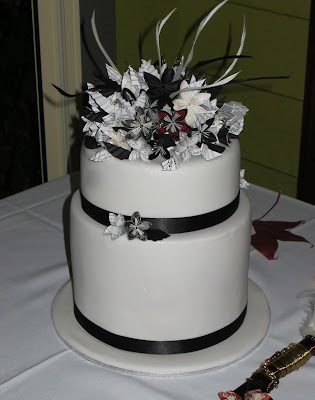 All the flowers were on wires, and we used the wires to attach them to the cake. This meant that the paper was not in contact with any wet icing that would make the ink bleed. To make the topper the bride used wires to attach the flowers to a polystyrene base, and we placed the whole base on the top of the cake when it arrived at the venue. Hope that helps!